Italpinas Development Corp. (IDC) recently stressed the importance of long-term ‘green’ investments in the urbanization of emerging cities in third world countries. IDC chairman and chief executive officer Romolo Valentino Nati told the Manila Standard that his company remains committed to environmental sustainability, through elegant architectural solutions. 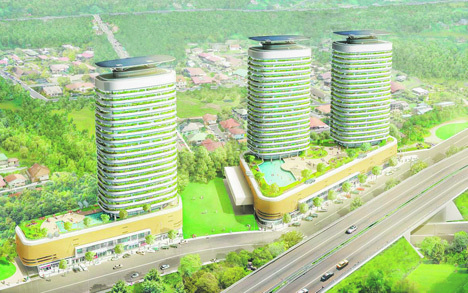 Nati said the Italian-Filipino real estate developer has built eco-friendly mixed-use projects in northern Mindanao, such as Primavera Residences and Primavera City in Cagayan de Oro City. He likewise revealed the construction by Italipinas of its latest high-rise called Miramoni green residences in Sto. Tomas, Batangas (Seen in photo). The project was named the Best Innovation Project of the year during the 2018 Lamudi-Outlook Property Awards 2018. Nati was one of the panelists who participated in the discussion about urbanization during the “Sustainability Summit Asia 2018” organized last month by The Economist in Kuala Lumpur. Environmental issues such as climate change, renewable energy, and sustainable infrastructure to offer fresh perspectives for the region, were discussed during the summit.